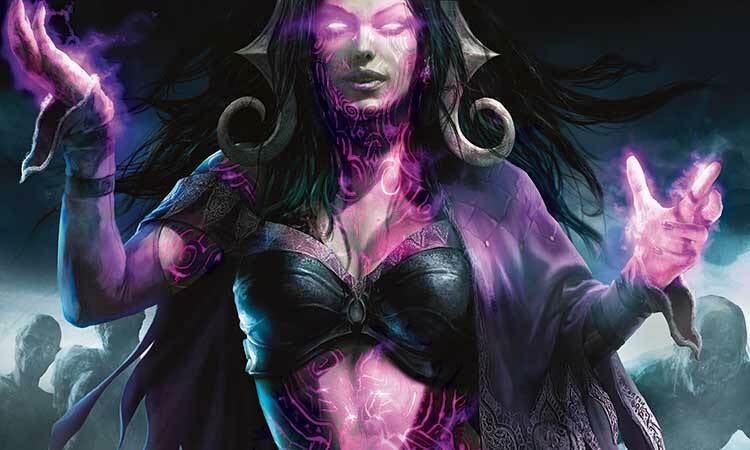 Liliana Vess is perhaps the most powerful necromancer in the Multiverse, but her life has been haunted by mighty entities that seek to control her. The dragon Planeswalker Nicol Bolas, the four demons she bargained with to gain her power, and the mysterious Chain Veil have all exerted their powerful influence over her, leading her down paths of betrayal and murder. 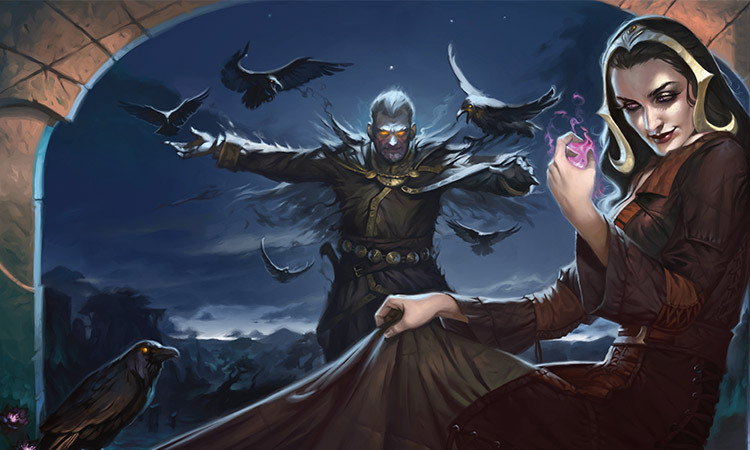 And the meddling of an even more enigmatic figure—the Raven Man—led to the death of her brother and the ignition of her Planeswalker spark. Her every effort now is directed toward seeking her freedom, with slaying her demon masters and breaking the hold of the Chain Veil at the top of her list. But while she focuses on these masters, the other forces pulling on her won't simply leave her alone. 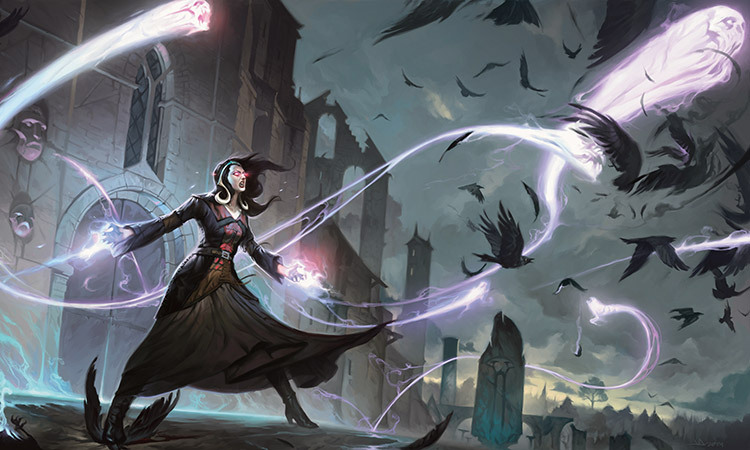 Liliana Vess waded into the teeming streets of Ravnica's elegant Second District. She strode through the crowd, which parted like water around her. She adjusted the top of one long glove, and the croak of a nearby raven just barely touched her awareness over the din of the crowds—the crowd of people in the city and the crowd of spirits pressing at her thoughts. Did Jace hear them? she wondered. It was hard to imagine that he hadn't—the Onakke spirits were a constant hubbub in her mind, and Jace's telepathic abilities had surely picked up on the noise. But he'd given no indication that he had discerned their presence, or indeed that he had any idea what the Chain Veil was doing to her. Do I have any idea what this thing is doing to me? As if in response, the voices in her mind surged in volume. ". . .Vessel of destruction . . . root. . ."
"Oh, shut up," she snarled, giving her head a small, fierce shake that freed a single lock of hair from her headdress and left the strand hanging over one eye. A young vedalken's eyes widened at her outburst, and he ducked quickly out of her path. She tucked her hair back into place, and the voices subsided. They had been strongest on Shandalar, of course. It was the Onakke's home plane. Here on Ravnica, or on Innistrad, or any of the other half dozen planes she'd visited recently, they usually remained at the level of background noise. In the context of her conversation with Jace, though, that background noise had felt more like a clattering of kitchen pots, and she couldn't quite believe he hadn't noticed the clamor. Maybe he would have, she thought, if we hadn't been interrupted. And if he had noticed? What then? Maybe he would have helped. Liliana had come to Jace in search of a loophole, a way out of the mess she'd landed in. The power of the Chain Veil was immeasurable. It had allowed her to kill Kothophed and Griselbrand, two of the demons to whom she owed her soul—part of the pact she'd made to regain some of the godlike magic she had lost with the Mending. But in the process of trying to free herself from one bargain for power, she had unwittingly entered into another. The Chain Veil's magic came with a cost, a terrible toll on both her body and her mind. In desperation, she had taken it back to Shandalar and tried to leave it there, but she found that she couldn't. It was bound to her, and her to it. Jace was supposed to help her find it—some way for her to continue using the Chain Veil without being enslaved by it and the spirits it carried. Jace was nothing if not clever, and if the Veil had some kind of hold on her mind, she felt confident that he could help her break it. Instead, Jace had asked her for help, after that soldier, Gideon, showed up. She scoffed aloud at the thought, drawing startled glances from the people around her. A well-dressed merchant met her gaze, then blanched and lost himself in the crowd. A goblin found himself squarely in her path and scurried quickly away, not daring to look up at her. And a raven, perched on a wall nearby, fixed a glossy black eye on her. She scowled at it and walked on. Gideon had come to the restaurant, interrupted their conversation, and practically begged Jace to come with him to Zendikar, some backwoods nowhere plane he'd said was being devoured by giant monsters. Liliana had almost laughed him out of the building—as if she or Jace could bother with such a place. As the Living Guildpact, Jace had Ravnica to worry about, after all; and besides, he was going to help her. But he hadn't. Instead, he had agreed to help Gideon. "I know you'll do the right thing," Gideon had said—and Jace fell for it. And then he'd been ridiculous enough to ask Liliana to come with him. She scoffed again at the thought of it. Then a sort of weight settled in her chest, and she frowned. She and Jace had shared some good times, had some fun together, and seeing him again had conjured up some surprising feelings. They had shared a house, and a bed, in one of Ravnica's poorer districts. She had helped him through a rough time, the dear boy . . . before sticking a metaphorical knife in his back and returning to Nicol Bolas, who she thought was going to help her extricate herself from the demonic pact that he had helped broker. What if this time could be different? What if I went with him and helped him? Maybe they would have some more good times. Maybe she could enjoy his company, even if it meant putting up with Gideon's self-righteous arrogance—he's almost as bad as an angel, she thought. I know you'll do the right thing, indeed. But maybe taking on some giant monsters and raising up their huge corpses to fight for her would be . . . fun? "Ugh," she said. Fighting Gideon's monsters would mean using the Chain Veil again, and she was right back where she had started. The croak of a raven. A raven on the wall. Now a startled raven in her face. She had been oblivious, and she silently cursed herself as she looked around, finally noticing where her feet had taken her while she'd been lost in her thoughts. She stood at the edge of a small, deserted courtyard. An old fountain, dry and crusted with lime, provided a perch for fully a dozen ravens, each cocking its head to turn an eye toward her. More of the birds hopped over the cracked cobblestones or flapped from roof to roof on the buildings surrounding the yard. One bird, stretching tall from its perch atop the fountain, uttered a short series of knocking sounds, then snapped its beak at her. 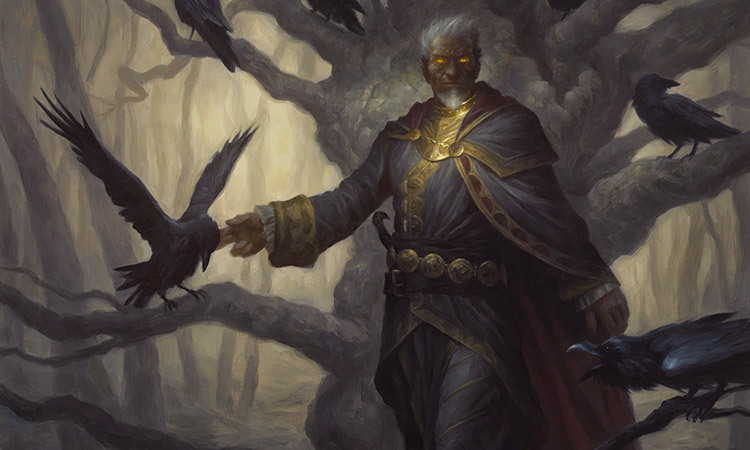 "All right, Raven Man," Liliana said. "Enough of your games." All at once, the ravens perched on the fountain sprang into the air in a flurry of beating black wings. They formed a churning cloud of feathers and harsh calls just above the cobblestones, and then the Raven Man stepped forward from their midst—and the birds were gone. Liliana clapped her hands slowly and drawled, "Oh, well done. Do show me another trick." He looked no different than when she had first met him, back home among the trees of the Caligo Forest. The intervening century had left no greater mark on him than it had on her own features. Garbed in black and gold, with white hair and golden eyes, he seemed as much a vision from her past as a living man, but he reached out and placed a very solid hand on her shoulder. "You need help," he said. Liliana shrugged his hand off her shoulder and moved a step farther away from him. 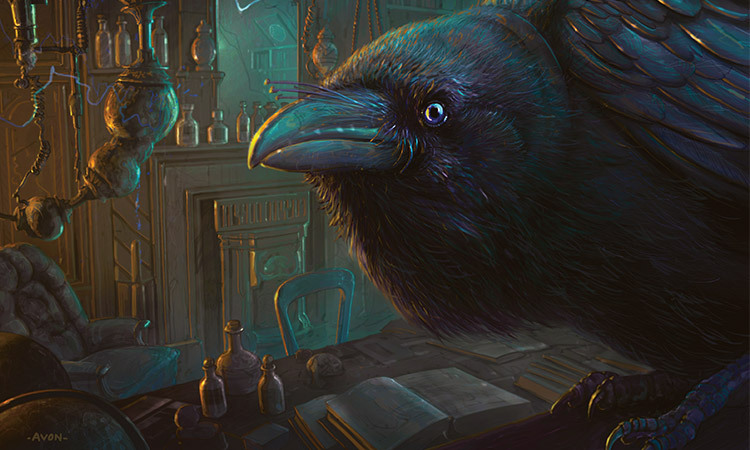 No encounter with the Raven Man had ever ended well for her—or for those she loved. "And I suppose you're here to offer it?" she said. He scoffed. "Would you accept it if I did?" "I don't think you know how to accept help," he said, stepping closer again. "I don't need it," she said. She planted a hand on his chest and pushed him two steps back. "Everything's under control." "Ah, I see." He looked amused, and a sudden desire to blast the ridiculous smirk from his face seized her. "So what is your next move?" "Scouring you from the earth and turning you and all your little bird friends into my zombie minions." "Tell me why I shouldn't do it," she said. "You make it sound so easy." He shrugged. "Maybe you should." "It would be easy," she said, but there was no pleasure in it. It would be easy because of the Chain Veil. She could already feel its power surging up in her, as if it were anxious to be put to use. And with it, the Onakke voices grew louder in her mind. She turned away from him, shaking her head to clear them away. She felt his breath on her ear. "Turning your back on an enemy, Liliana Vess?" Something pricked through her gown in the small of her back—he held a dagger. "I don't fear you," she said, and a ring of darkness burst out around her, driving the Raven Man back. "Of course you do," he said. She wheeled around to face him again. "Who are you?" she demanded. "You're a Planeswalker—I met you on Dominaria, on Shandalar, and now here. You're a shapeshifter, obviously. And you spoke to me with the mouth of a corpse on Shandalar. Who—what are you?" His lip curled into a smile more cruel than amused, but he said nothing. "You spoke of the Chain Veil as though the whole thing were your idea—you cultivated the root of evil, the Veil of deceit, the vessel of destruction." As she said the words, the Onakke spirits echoed them in her mind, with hissing whispers that resounded like the inside of a mausoleum. "But Kothophed sent me to fetch the Chain Veil for him." "Yet you did not return it to him." "I run errands for no one. Did you somehow give the demon the idea of sending me after it? You certainly planted the seed of his destruction if you did." "You are the vessel for a much greater destruction than that." His words sent a cold prickle running down her back, but she stepped closer to him with a sly smile. "Oh, yes," she said. "I bring destruction wherever I go. Which brings me back to my earlier question—why again should I not destroy you? Right now?" "What about your own destruction?" She scowled. "What are you talking about?" In her darkest moments, she had begun to fear that the Chain Veil did carry the seeds of her own destruction, that after fighting so long and so hard to avoid death, she had taken it into herself. But she wasn't going to admit that fear to the Raven Man—or, indeed, show him any fear at all. "Look around you, Lili," the Raven Man said. He ignored her. "Death is staring at you from every side." She did glance around, without meaning to. Ravens were everywhere, dozens of glassy black eyes fixed on her. "Two more demons still hold you bound by the words on your skin, and those two are mightier than the first. The Veil you wear so brazenly at your hip takes more and more of your strength every time you use it. But without it, your demons will tear your heart from your chest." "I haven't had a heart for a very long time." An unwanted memory of Jace flitted through her mind. "And that's not all. The beastmage you cursed is still hunting you, killing more and more Planeswalkers as he searches for signs of your passage. Even your beloved Jace is inviting you to your death." She opened her mouth to retort—then closed it again, furrowing her brow. "Oh, so shall we add mind mage to your list of accomplishments?" she said. "Get out of my head, Raven Man. There's no room for one more." He ignored her. "Every side," he repeated. "Yes, well, I'm quite accustomed to the presence of death." "You're accustomed to murder," he snapped. "You're accustomed to corpses that are bound to your will. You're accustomed to using death as a weapon. But death is coming for you, Lili. Death you can't control. It is growing inside you, and there is nothing you can do." "There is always—" She lifted her hands, and a blinding flare of purplish light streaked out from her—her hands, her eyes, the glowing whorls and writing engraved on her skin, and the little skull-shaped beads that adorned the Chain Veil—to engulf the Raven Man in a conflagration of magic. "—something to do," she finished. Dead ravens and tattered feathers littered the cobblestones where the Raven Man had stood. A flurry of wings beat the air right behind her, and she whirled to see him emerge from another cloud of birds, his dagger bared. She grabbed his wrist and tugged at the vital energy that pulsed in his veins. The blade clattered to the ground as he dissolved again into a dozen croaking ravens, their wings battering her face and arms. Her hand gripped a single dead bird. "Fine," she said. "I can make my own flock." The bird in her hand squirmed and wriggled free, now a tiny zombie bound to her will. 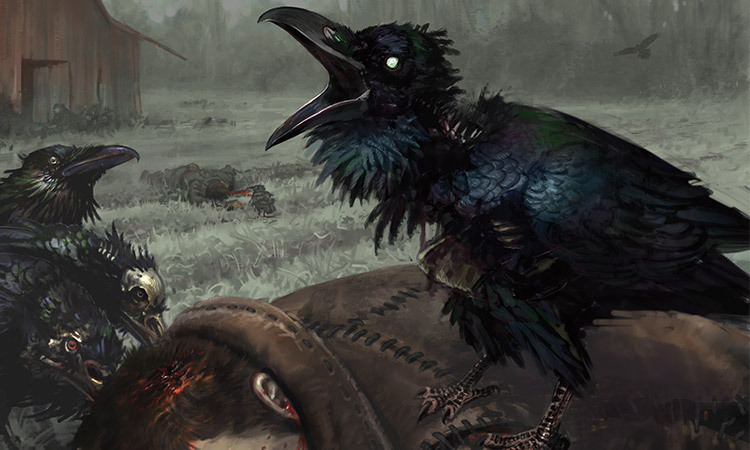 Around the courtyard, more zombie ravens lifted themselves off the stone, hopping and fluttering toward her. When another cluster of living birds began to form, her own little minions threw themselves into it, tearing with sharp claws and heavy beaks to rend the living flesh. She thought for a moment that she saw the Raven Man start to emerge from the frenzy, but he threw up his hands and was gone. A mere handful of ravens escaped the fray, fluttering high above the buildings and scattering to the winds. Liliana felt a trickle run down her shoulder. Looking down at her skin, she saw blood welling up in all the places where the purplish lines of her demonic contract were fading from view. Just tiny pinpricks of crimson—but then, she had barely tapped the full power of the Chain Veil. She sat down on the edge of the fountain to catch her breath and gather her thoughts. It was true—she was trapped. 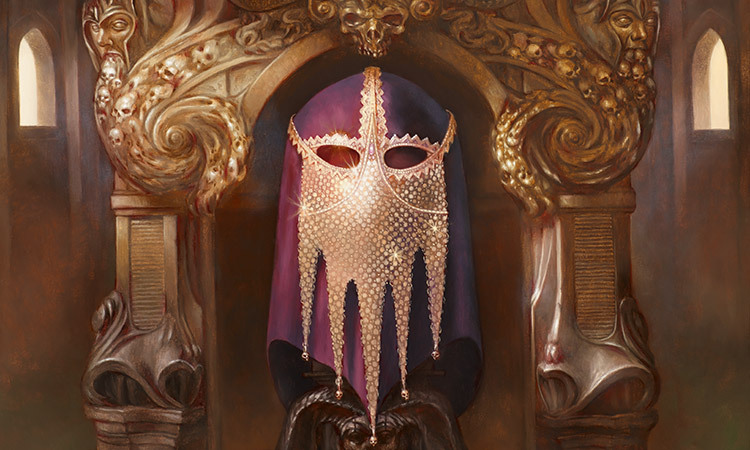 If she continued using the Chain Veil like this, it might drain the life out of her by the time she killed her two remaining demons. If she tried to face her demons without the power of the Chain Veil, they would tear her apart. Helping Jace fight Zendikar's giant monsters presented the same choice: death if she used the Veil, death if she didn't. "I don't need help," she said aloud. Jace can go solve Gideon's puzzle. I'll solve my own. She stood up, closed her eyes, and took a deep breath. Her stomach lurched a bit as she pulled open a door between worlds. Just as she stepped through, she heard the mocking cry of a raven at her back.